Ahoy! Mark your calendar for the 8th Annual Funky Finds Spring Fling on March 12th & 13th, matey! This year's Spring show will take on a decidedly nautical theme. We've cast a wide net to make sure we've caught only the freshest and funkiest handmade products in the retail sea. Be sure to arrive early on Saturday for the best chance at reeling in lots of choice catches. But have no fear, these vendors will be sure to keep the decks fully swabbed and well-stocked throughout the entire voyage! Most vendors accept credit cards, but your best bet for shopping is a pirate's chest of cash (on-site ATM available)! WHERE: Will Rogers Memorial Center, 3409 Burnett-Tandy Dr. ADMISSION: FREE! All ages and pets welcome! Parking fee payable by cash or credit card. The free family and pet-friendly indoor event will give your budget maximum positive impact on your local community. 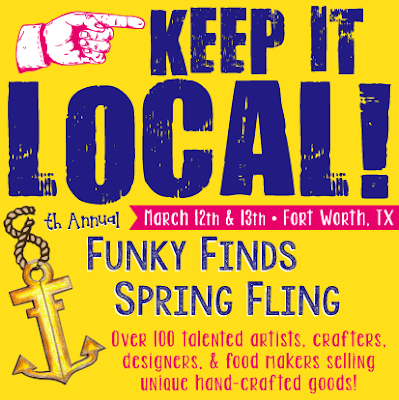 Know where your dollars go by shopping at Funky Finds! Money spent on products at the event go directly to the artisans "creating" their bottom line. The Spring Fling will feature a charitable raffle benefiting The Humane Society of North Texas and CASA of Tarrant County. Proceeds go directly to the animals you'll be able to see, hear, pet, and adopt on site, and to CASA whose volunteers will be happy to tell you about volunteer opportunities and how donated funds benefit their efforts.To date, Funky Finds has raised over $30,000.00 for local charities and over 125 animals have found a forever home at Funky Finds events! Funky Finds events are unique because of the time spent jurying the applicants to find the funkiest mix of makers! All items are hand-crafted or hand-altered by the artisan selling at the event. This event is the perfect opportunity to support the local economy, local arts community, local charities, and purchase one-of-a-kind products! Align Chiropractic, Quirk Books, Brandy Austin Law Firm, PLLC, and Right On! Graphics.